Proper granite care guidelines are seldom provided by granite counter installers or contractors. 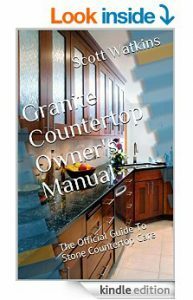 Did you get a granite countertop care manual when your new stone tops were installed? Probably not. If you were told to clean your countertops with Windex or dish soap, you were given bad instructions. Get your granite questions answered – how to make granite shine, how to fix dull granite around your sink. Also, how to get stains out of granite, how to remove oil stains from granite, and granite restoration. What’s the best material for kitchen countertops? What’s the best material for a bathroom vanity? Which stones to use for counters – Onyx Countertops, Limestone Countertops, Marble. Learn how to properly clean granite countertops, how to properly seal granite, and how to remove granite stains. Moreover, here’s how to repair granite cracks & chips, and much more. Granite Care Pro understands the science of stone countertop care. We have produced and installed thousands of granite countertops. Simple care and countertop maintenance will help preserve the beauty of your stone tops and granite top tables for years. Should You Seal Granite Tables? Granite countertop kits feature combinations of highly rated granite sealer, granite cleaner, and granite soap film remover. You can do your own granite countertop maintenance and save money. The do-it-yourself granite repair kit provides everything you need to repair granite, marble, limestone, sandstone, travertine, and all other natural stone countertops. Repair scratches, chips, and seams. Professional results on quartz countertop repairs too. Granite Outdoors. How to Seal Granite Outdoors, How to Clean Granite Outdoors. Recommended material for outdoor kitchen tops. Weatherproof supports. Outdoor Granite Supports – Stainless steel brackets for outdoor, shower, salt water, sauna. Weatherproof designs.